I'm a couple days late posting this since I was out of town, but here it is... This month I got a package from Lauren out in Pennsylvania. She sent me some really good, healthy treats so I was pretty excited about this box! Fig Bar - This was the first thing that I ate. It was delicious!! Great, sweet snack that wasn't unhealthy. Chocolate Cherry Kiss Coffee - SOOOO yummy! I usually use my Keurig and this was definitely worth busting out my old coffee pot. Granola - Two different kinds. I've tried (totally eaten) one but haven't had a chance to try the other yet. The Sheila's Crunchy Delight pumpkin granola is the one that I tried and absolutely loved. This was a local item and I so badly wish I could get it around here! I'm going to have to visit Pinterest to see if I can find a recipe that's just as good. I was definitely happy with my box this month! Not only was Lauren the person who sent me my box, but I also got her for my FPP. It was fun to send and receive items to/from the same person! 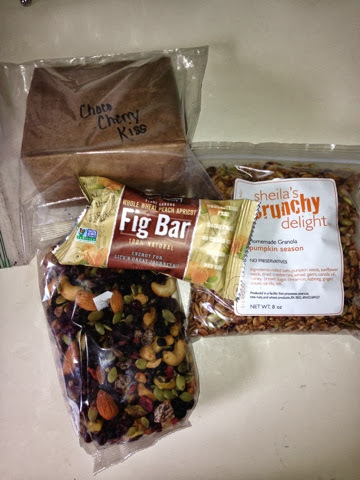 I was also interested to see that Lauren and I sent some similar items (granola, coffee). I've had wonderful experiences with FPP and will definitely be continuing this for a while! If you're interested please visit the Lean Green Bean for more info!